Five weeks of celebration in May usher in Summer to this great Northwest community. See what’s happening this month in the list below or visit the City of Grants Pass Event Calendar. The Fantasticks is a funny and romantic musical about a boy, a girl, and their two fathers who try to keep them apart. The narrator, El Gallo, asks the audience to use their imagination and follow him into a world of moonlight and magic. The boy and the girl fall in love, grow apart, and finally find their way back to each other after realizing the truth in El Gallo’s words that “without a hurt, the heart is hollow”. There’s always time to remember this romantic fable about a boy, a girl, their two fathers and a love that grows with each season. Experience Grants Pass welcomes you to First Friday Live, a monthly community celebration taking place in downtown Grants Pass. Our retailers, galleries and restaurants host special receptions, performances, screenings and other events showcasing the work of local and regional artists. Other creative pursuits are also celebrated: culinary, crafts, music and theatrical. There will be Salsa music and dancing in the 5th & H Street parking lot along with other exciting entertainment. Parade starts at 10am. Judging and Tasting for the Chili Cook Off will begin following the parade. Prizes will be awarded. Location is at the Merlin Park. Big Thank you to the North Valley Business Association, Merlin Park Board, Redwood Lions Club. Join the Upper Rogue Valley winemakers as they introduce their newest wines and share their creative inspiration while pairing delicious appetizers with some of the best wines from each of these wineries: Agate Ride Vineyard, Cliff Creek Cellars, Del Rio Vineyard, Folin Cellars, Kriselle Cellars, Labrasseur Winery. Roam the Rogue is the perfect way experience the Upper Rogue region of our valley. Wine’d through the beautiful and scenic Upper Rogue in this self-guided tour from 11-5pm on Saturday and savor the wines, deliciously paired appetizers at all 6 participating wineries. Designated Driver tickets are available at $10.00 each and include appetizers and non-alcoholic beverage. Come feel the power of live rock, jazz and big band music with the Grants Pass High School bands as well as special guests: U of O Yellow Garter Band, Rogue Gold, Southern Oregon Jazz Orchestra, GPHS Jazz Ensemble. New Orleans themed Dinner in the GPHS commons will be served between 5:00-6:30PM complete with savory entrees and delicious side dishes as well as live dinner entertainment for the whole family. Jazz Festival begins at 7:00 PM in the Performing Arts Center at Grants Pass High School featuring an exciting line up of professional musicians playing a variety of musical genres as well as the GPHS Jazz Band. Thanks to a generous donation from Evergreen Bank, we will be using our brand new race timing system and finish chute. Thank you Evergreen Bank for your support of our YMCA and of our community! Medals for top finishers, ribbons two deep in all age groups. Random drawings for pre-registered only. Must be present to win. Raffle Prizes Include: 6th Gen Ipod Touch, GoPro Hero Session Camera, Fitbit Charge 2 & SO MUCH MORE! Restrictions: No roller skaters, bicycles, skateboards, dogs or unregistered runners. Casino Night….Tickets are $50 each and include a full diner, desert, 1 raffle ticket and $100 casino cash. Must be 21 or older as these are real casino tables and chips. Please join us for a fun all inclusive night. Club Northwest Kidzone will provide childcare for $10 per child and includes pizza and entertainment. Please click the “shop now” button on the South Middle School Facebook page and enter the dollar amount for the number of tickets. An email confirmation will be sent to you by the PTSA with an EIN number and the event details. Tickets will be “will call” and picked up at the venue the night of the event. A live swing band? In a barber shop? Rogue Barbers and Candela Dance Studio are teaming up to present “A Night of Swing to Remember,” featuring Band du Pays! We’re VERY excited to bring this fabulous band to Grants Pass. Prepare to roll back the decades as we enjoy Big-Band hits, jazz classics and sultry serenades. Dress up! Think vintage, WWII era. Use your imagination. We can’t wait to see what you come up with. Rogue Barbers’ classy ambiance will help us turn back the clock and pay a visit to this alluring era. SpeakEasy will be in the house, serving up beer, wine and maybe more (details to come)! This is a great date night, friends’ night out or opportunity to meet new people. NO partner needed for the dance lesson, and no dance experience necessary! 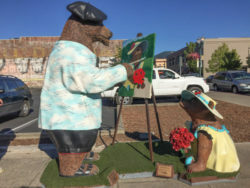 37th Annual Rogue Valley Piecemakers Quilt Show – “Garden Party”. Over 150 Quilts on Display! Boutique Featuring Handcrafted items. Vendors – Special Exhibits – Raffle Baskets – Door Prizes. Largest Native event in Southern Oregon. Happens every Mother’s Day weekend each year. Sponsored by People of the Earth Foundation promoting the encouragement of the Native Visual & Preforming/Cultural Arts. Featuring beautiful Dancers, Singers, Drummers and delicious food prepared by Coyote Kitchen. A special presentation for all the Mommies and Grandmas on Sunday at 3pm. They will all receive a free flower in honor of. Representing the, “Gift of Life”. Enjoy the music of a string quartet, a tour of the magical Bear Hotel, and a traditional English tea to honor your Mother. Menu will include cucumber and other dainty sandwiches, scones with clotted cream, and an assortment of cakes and cookies. Imagine simply having to show up with your ticket and then sauntering down the wonderful streets of Downtown Grants Pass while enjoying interesting shoppes, tasting delectable wines, wonderful food and great art with your friends and family! The TCA Wine Strolls have become very popular downtown events and tickets always sell out very quickly. Why are they so popular and successful? 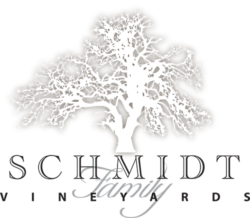 Grants Pass has not only some of the best and unique merchants in Oregon but we also have some of the best wineries and food in Southern Oregon. Our participating merchants and vendors make the event so easy, so inviting and so much fun! Taking place on Mother’s Day weekend, this will be an evening dedicated to Moms. With live musicians, Jocelyn Schmidt will entertain the audience with a mix of theater tunes including great hits, old and new. She will be joined by special guest Janeen McGinnis (Concerts in the Park, Back to the Fifties & Funny Girl), Sarah Foster, David Schmidt, Wolf Bradly (from Los Angeles) and Eden Daggett as well as featuring local dancers from All That Jazz and Stillpoint Dance Studios. The show will be introduced by comedian, Miles Kehoe. The production is also supported by a wonderful creative team consisting of Penny King for Direction and Choreography, Nancy Hodgson for Musical Direction, Sabina Hillman for additional choreography and Heidi Whitehead for Stage Management. The team also includes Lighting Design by Clyde Highbarger, Sound Design by Tim Kasdorf. Music is arranged by Michael Wing and conducted by Ron Strom. A memory making family adventure for the special Mom in your life – Sunday, May 14th 2017 from 9:30 until 1:30! Enjoy a delicious brunch prepared by Bridge Street Catering, which includes, eggs, bacon, sausage, fruit, muffins, quiches and chocolate dipped strawberries! Don’t forget the bubbly – Champagne! Stroll through the park for a fantastic day of up-close animal encounters and photo opportunities. A day of family, critters, and fabulous food! 3 Rivers Chorale has been dedicated to presenting fine choral music to our communities for over ten years. First under the direction of Dave Marston, the Chorale sang madrigals and the Beatles in a memorable first concert in 2004. Since Kate Campbell took over in 2010 following Dave’s untimely death, singers in the Chorale have performed two or more concerts each year, in Grants Pass, Cave Junction and at Crater Lake National Park. Celebrate your mom by bringing her down the river! All Mom’s receive 50%, all day! This unique concert series presents singer-songwriters playing original music in an intimate, all-acoustic setting, and telling the stories behind those songs. The series is a partnership between Barnstormers and local musician and community music enthusiast Mike Smith, who envisioned the project after his first visit to Barnstormers a few years ago. The partnership is a natural fit of storytelling and artistry in perfect venue for acoustic music. John Nilsen- Master is a pianist, guitarist, and vocalist (Portland, OR). The events will also feature no-host wine, beer, and goodies provided by The Vine. Kid’s carnival fundraiser for the Women’s Crisis Center. Lots of game and prizes. (Free) BBQ food, soda available. Wildlife Images and other organizations will be attending. Some raffle prizes include boy & girl’s bike, Wildlife Safari tickets, Emigrant Lake Water Park tickets and much more. Lots of fun for all kids 12 and under. Come experience adventures in antiquing! Sponsored by the Grants Pass Antique Dealer’s League, this show brings antique and collectible dealers from the entire west coast to sell their treasures. There will be vendors selling antiques and collectibles. For more information, please contact Jeff of Karen at H Street Antiques, 541-956-1200. Tickets are $49 each and include a commemorative Wine Trail wine glass. How does Uncorked work? 18 wineries in the Applegate participate in this fun, self-guided tour. You pick your starting location from the list below, but you’re free to visit any number of the 18 wineries on the Trail. Each winery will offer both an appetizer and a wine for tasting. We’ll be posting the final list of pairings closer to the event, so check back for details. This event also provides a great opportunity to stock up on wines for gifts or parties. We encourage you to bring your friends, designate a driver and enjoy this great event. Its also the perfect opportunity to explore new wineries that you’ve never been to before! Note that the food pairings provided are not meant to be “meals”. We encourage participants to consider dining before or after the event. Designated drivers don’t need to purchase a ticket and may sample the food. 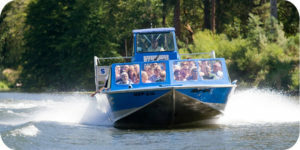 Since 1959, The Grants Pass Active Club has held Boatnik every Memorial Day weekend along the Rogue River in Grants Pass, Oregon. For more than 50 years families have enjoyed this five day event that supports the children and youth programs of the communities of Southern Oregon. All funds raised by the Grants Pass Active Club from Boatnik are returned to the community by supporting local children and youth programs. The activities start Thursday evening in Riverside Park with the Davis Shows Carnival featuring food, rides, games and family fun. The excitement continues Friday which includes a spectacular fire works display on the river. Saturday morning features the well-known Boatnik parade that travels through downtown and ends at Riverside Park. Throughout the weekend the festivities continue in the park where there are a whirlwind of activities that include: Sprint and Drag boat racing, carnival rides, arts and crafts, Papa John’s pizza eating contest, children’s activities, Bingo, food vendors, Monday Sundaes, the Chevy Drive It Home Golf Shoot Out and a second night of patriotic fireworks. Monday is the highlight of Boatnik featuring the World Famous Tom Rice Memorial White Water Hydroplane Race. Thousands of locals and visitors from around the world come to share the tradition and unique experience of Boatnik. Date: Debut new Cubs during Boatnik Parade on 5/27. All bears go on display 5/29. Hillcrest Memorial Park is hosting a Memorial Day observance. There will be music and the laying of wreathes and flowers.